I went on vacation last week, and honestly, I knit less than I expected. I did get one sleeve done and another one started. Well, let me elaborate a bit first. This is sleeve #2, but sleeve #1 is not completely finished. I took 2 skeins with me, one for each sleeve, and it is taking more than one for each. I did not finish the first, so that I could start the second with a full skein. This is my own pattern, and so far, it fits. 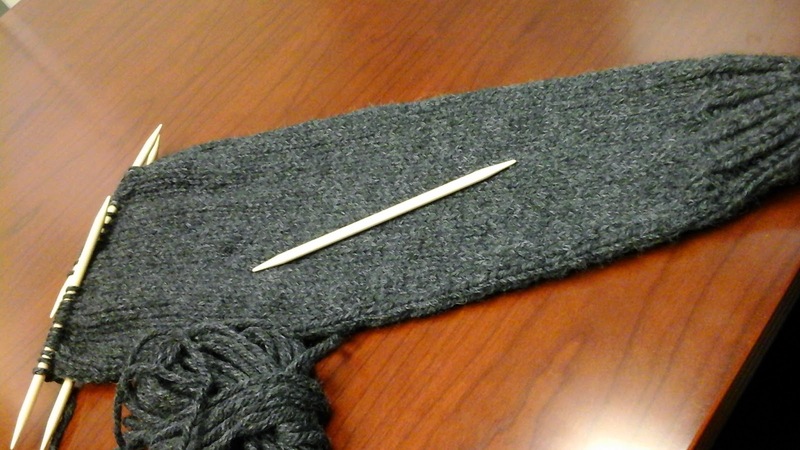 I did a gauge swatch, and did the math, and started on the sleeves, just to try and make sure my gauge would work. So far, so good. I have more increases left, but I should be able to finish them this week. I will walk you through all the steps on this one, because although there are a lot of "custom sweater" patterns out there, this one is bottom up, with set in sleeves. I tried to find one on my own, but could not, so I dug out my pencil and paper and calculator, and started working on it. Would you like to join in? I'll post the series, but for now, grab "a sweater's worth" of yarn, no matter what weight, and start your swatch. Get your fabric right, and meet me back here. We will go through it together. Feel free to leave questions or comments as we go.